Question: We’ve had a very hot summer so far in the Northeast, which has led to low, warm water in trout streams. Last time I took the temperature of my home river, it was 72 degrees, and I couldn’t find any fish. Where are the best places in a river to catch trout when the temperature rises into the low 70s? Answer: The best place to look is in a different stream, one with cooler water, which usually means higher elevation mountain streams. Although many guidebooks say that brown trout can “tolerate” temperatures in the low 70s, that doesn’t necessarily mean that it’s good for them. When the water gets that warm, there’s less dissolved oxygen, the fish have less energy, and any undue stress might be the deciding factor in whether the fish survives under suboptimal conditions. So, just because we can fish then doesn’t mean we should. Last week, my friend Doug drove three hours from his home near Boston to fish his beloved Battenkill in Vermont. When he arrived, he checked the water temperature and found it to be 72 (just like yours). Deciding that the health of the trout was more important than his angling enjoyment, he chose not to fish the river at all—six hours of driving be damned. Luckily, you can’t swing a cat around here without hitting a cool brook-trout stream coming out of the mountains, so all was not lost. Where you draw the line is up to you, of course. For me, it’s 70 degrees. That’s probably a couple degrees lower than what a fish biologist would say is an acceptable temperature, but I’d rather err on the side of caution. And just because you can’t cast for trout doesn’t mean you have to do something else like (horror!) play golf. Keep in mind that there are plenty of warmwater species that will eat a fly and give you that tug on the line you crave. And if you’ve ever caught a trout in really warm water, you’ll know that the fight is nothing to write home about and it’s tough to revive the fish when you release it. Ultimately, we have to balance the importance of our angling enjoyment with the health of the trout. I don’t know any fly fishermen who set out to do harm to their quarry. 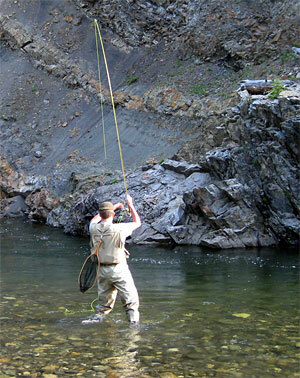 If we take care of the trout when water conditions are bad, we ensure better fishing when the situation improves.